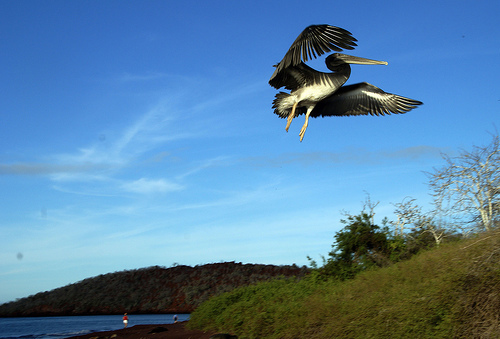 As you approach Rabida from your boat, it will not be immediately apparent that this small island offers an abundance of wild life and a great opportunity to absorb some of the richest Galapagos landscape. Soon, as you first place your feet on the stunning red sand beach, that will change. Have your camera ready so that you don’t miss a thing. 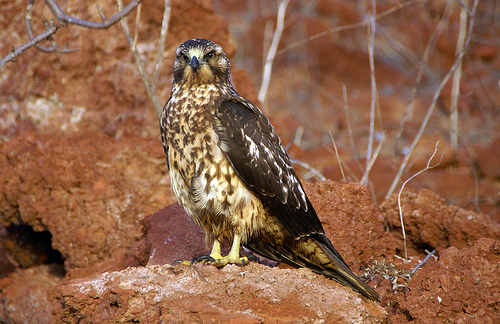 A visit to Rabida begins with a wet landing on a beach of reddish/maroon sand. This unusual and dramatic color comes from high levels of iron found in what is called scoria, a particulate material created by explosive eruptions when hot lava meets sea water. Thus, your first impression upon arriving is that something special is right under your feet. Then you take a look around and the vista that appears is breathtaking. Observe the layers of color, light, shade and topography. 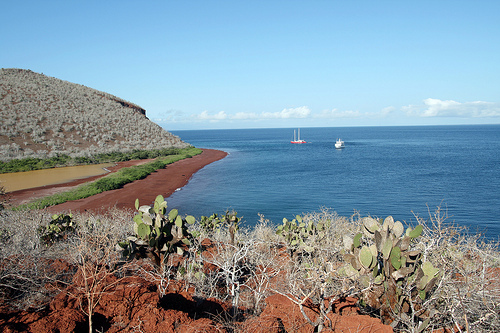 Take in the blue sky against the red sand, green grass, black lava and brown terrain. Open your eyes and you will realize that immediately behind the beach is an area of salt brush. There, brown pelicans nest. In the right season, you may see those nests and even some babies, though they will be very well shielded by their protective mothers. Look up to see the marvelous pelicans swooping up to their nests and look down to see them swooping into the clear Pacific Ocean to feed. Raise your eyes some more; there you will see the monumental cliffs of the now extinct shield volcano that produced Rabida Island. I love to go to Rabida just to view and share its unique volcanic formations. There are hills and valleys, caves and overhangs. Frequently eroded hills are evidenced and lava formations from spatter cones and lava flows abound to create a moonlike landscape. 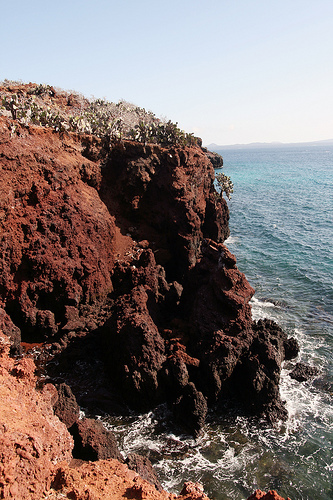 The volcanic cliffs house both Nazca and Blue Footed Boobies. Continuing along the path from the beach, you will arrive at a saltwater lagoon populated by gorgeous pink flamingos, Bahama pintail ducks and Stilts. 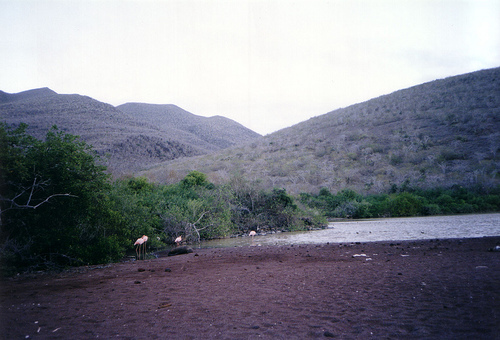 Rabida offers the best lagoons in all of Galapagos for viewing flamingos. 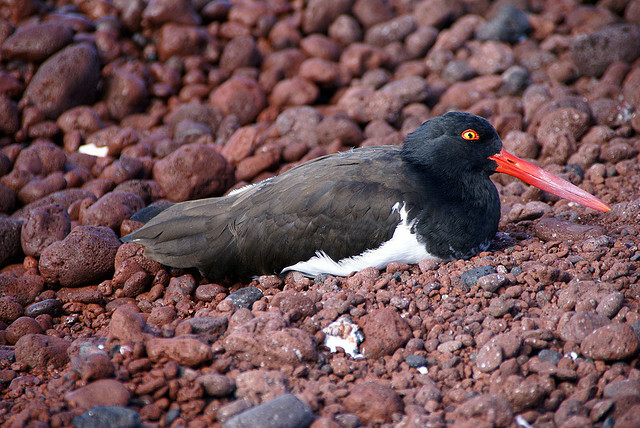 These large pink or reddish birds live in shallow saltwater lagoons and spend 7-12 hours each day eating pink shrimp larva that gives them their color. Sometimes on Rabida we see only one flamingo; other days we see dozens. I always expect the unexpected! Along the trail you are likely to see finches, doves, yellow warblers, hawks and mockingbirds. 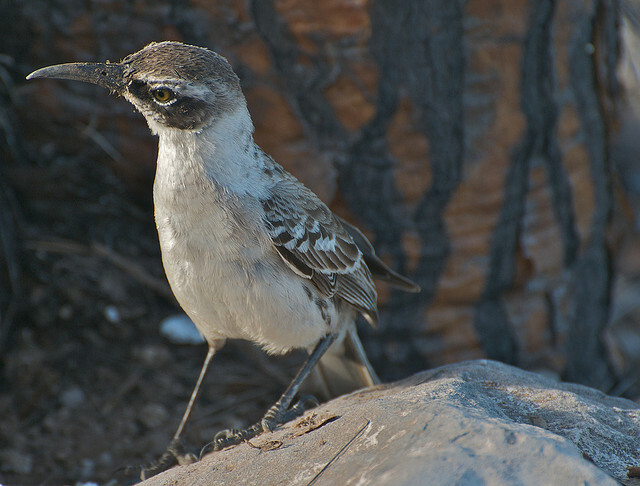 Of the fifteen finch species endemic to the Galapagos Islands, it is reported that nine have been seen on Rabida Island itself. 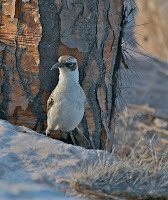 In contrast to the saltwater lagoon, Rabida also has dry areas where Palo Santo trees grow. There are caves in the volcanic walls. Your hike will continue up the cliffs of the volcano, through a rocky red terrain, and will end at an overhang which presents you with an unmatchable ocean view, panoramic observation of coves, the lagoon and the scarlet cliffs. 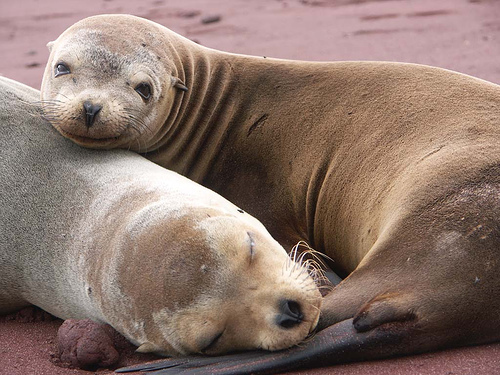 Don’t be surprised to see lazy sea lions and marine iguanas basking in the shade of the caves or on the beach. 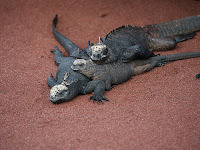 You’ll see them lazing around, protecting themselves from the harsh sunlight and capitalizing on the beauty around them! I certainly understand why anyone - including an iguana or sea lion - would choose Rabida as their home? The sea lions on Rabida may be basking in the sun, lounging on the cliffs or even taking a much-needed break from their mating rituals in the bachelor sea lion colony. 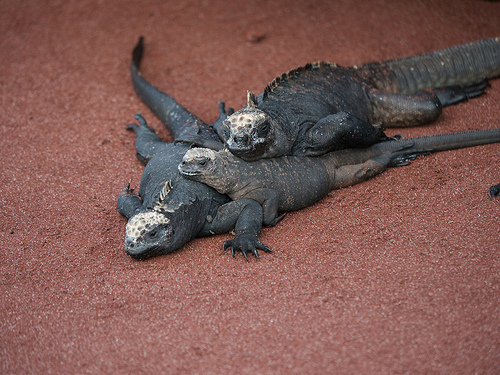 Rabida was once the home to geckos and land iguanas as well. Unfortunately, before they were eradicated by the Galapagos National Park Service, goats rendered those animals extinct. This satisfying walk is just part of a typical visit to Rabida, for its surrounding waters offer snorkeling opportunities. Among other thing, sharks and manta rays are commonly seen. Great picture of the flying pelican! Not fair to start posting about islands I didn't get to visit. Makes me jealous. Don't be jealous - just come back! 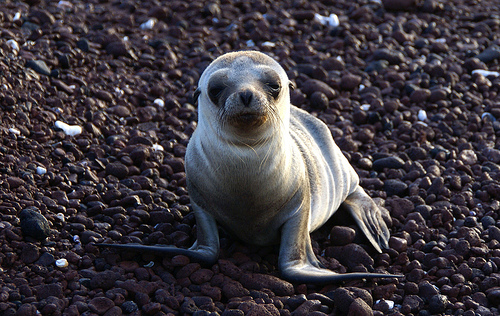 It’s a marvelous area for snorkeling as the water teems with fish, marine iguanas and our beloved sea lions. 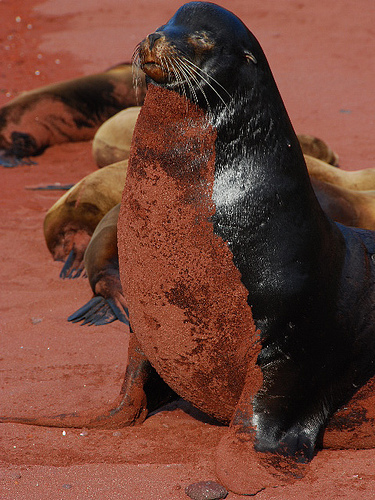 It also offers a special and unique landscape, including the opportunity to walk on a rocky red sand beach.